user easily changes their podcast logo. Podbean makes it easy to create the best podcast! Check out this video demonstration of how to create a new podcast with Podbean. This simple how-to video walks you through the easy steps of starting a podcast and creating a podcast site on Podbean. Keywords are important to help potential listeners find your podcast. Think about keywords that you may want to include in your podcast title and description. What are the main subjects of your podcast? What key topics do you cover? When you go to your account “settings” under “general options” you can choose your channel title, keywords and a brief description. For your title, a good format is Podcast Name: 2-3 key words describing what your podcast is about. So, for example if my podcast, Marketing Mania, is about blogging and social media, my title might be: “Marketing Mania: Blogging | Social Media”. Keywords listed for this podcast might include blogging, social media, digital marketing, content creation, social media marketing. The description should be in sentence form, but include those important key words also (example: “Marketing Mania covers everything you need to know about blogging and social media. Featuring digital marketing tips.”). For each episode, use primary key words in the title and description (i.e. What is the focus of this episode?). 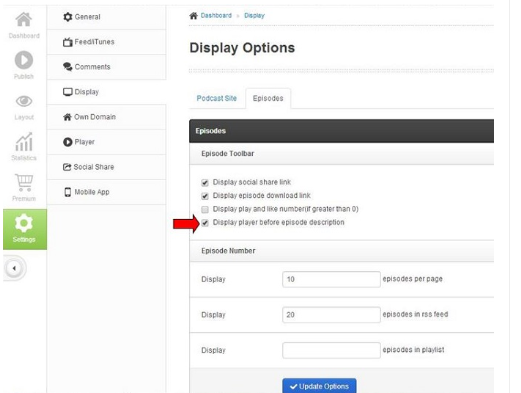 With Podbean, you can modify the permalink for each episode, which is also great for SEO purposes. If you hit “more options” when publishing a podcast episode in Podbean, you can also modify the information for iTunes such as subtitle, summary and keywords. This can help optimize your podcast for iTunes so that it’s easy for iTunes users to find you. If these are not modified, Podbean uses certain default information (such as the first 25 characters of your post text as the subtitle for iTunes); scroll over the (?) by each for more information. Using keywords is a great way to help new listeners find your podcast. Incorporate these tips to help your podcast stand out! 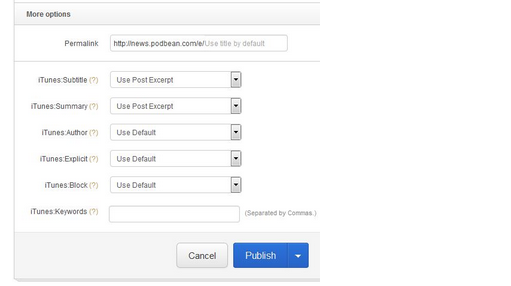 #Podbean has a new feature, to make it easier than ever to share your podcasts on the web! You can now connect your WordPress site to your Podbean account so that new podcast episodes will automatically be posted on your WordPress site. It is super easy to set up and start saving time! 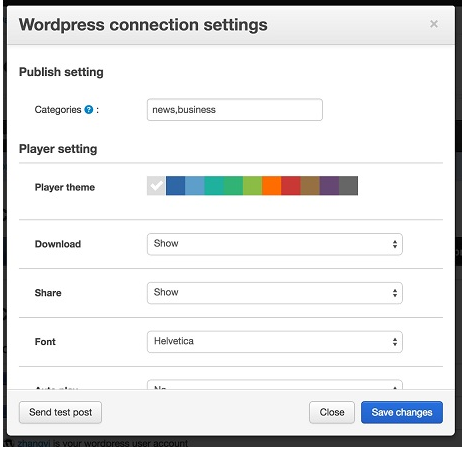 Go to Settings->Social Share and click on the “Connect to WordPress” button (only self-hosted WordPress sites are supported, not those hosted on WordPress.com). You will need to input your WordPress login url, username and password. Then, hit “submit” and you should see a success message at the top of your screen. 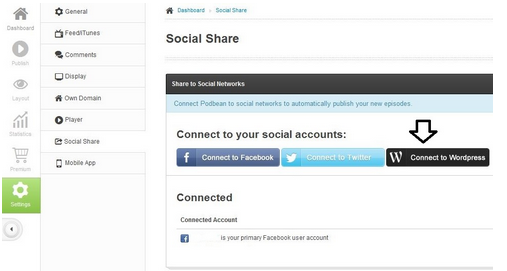 You can also customize your posting options. Click on the “edit” pencil icon for your connected WordPress account to get the dropdown menu of options. Categories allows you to set it up so that the episodes automatically post in one (or more) categories within your WordPress site (for example, your news or blog section). If you wish to post to more than one category, simply separate the names of the categories here with commas. You can also customize options for the look and feel on your site, such as player color, whether the download and share buttons are displayed, if the episode auto plays, and the video size (for video episodes). To see that everything is working, you can “Send Test Post”. Once you have the connection set up, simply publish a podcast episode as you normally do and the episode will now post on your WordPress site (there may be a few minutes delay for this to update). With this latest feature, Podbean saves you even more time, allowing you to share your podcast with ease! If you have any questions or need help, contact us at support.podbean.com. #Podbean has added new features to help you get the best look and feel for your podcast site! 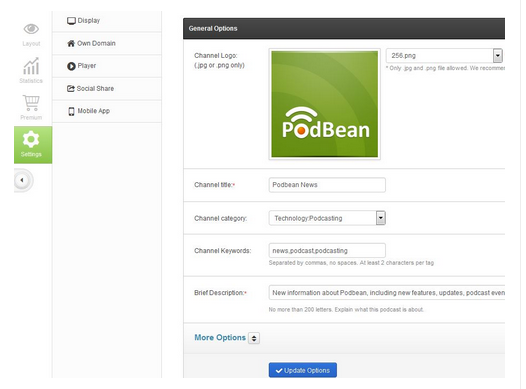 Now, you can further customize many of the Podbean templates to make them your own. The Podbean professional themes and many of the additional templates now offer you options such as changing your episode font (style, color and size), changing your theme’s color, and changing your channel title’s color and font. To make changes to your site, simply go to Layout->Themes in your Podbean dashboard and click on the “Custom” setting button of your current theme for the dropdown menu of choices (this is not available for all free themes). You will see the different areas you can customize, such as theme color, font color, font size and more. Simply click on the option you wish to change and choose your preference. Hit “Submit” to save the changes (you can then view your site to see the changes). You can also hit “Reset” to restore the theme defaults. 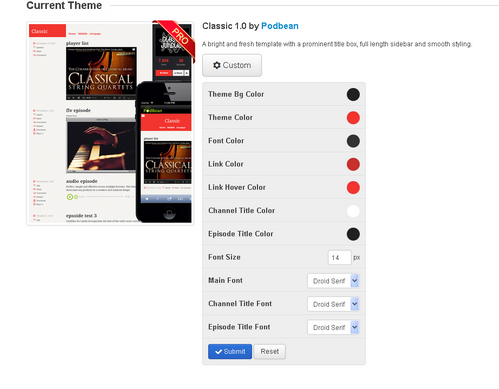 For more detail about how to customize these options, read our FAQ http://support.podbean.com/customer/portal/articles/1721407-how-do-i-customize-my-podcast-theme-change-fonts-or-theme-colors- With Podbean, making your site look great is easy! If you have questions or feedback, contact us at support.podbean.com. #Podbean offers different display options to make your site look just the way you like. We’ve added a new feature allowing you to choose where to display the podcast player for your episodes. Currently, the podcast player displays below any show notes/text description. But, some users prefer the podcast player to be the first thing users see in the episode. Now, with one quick step, you can opt to have your podcast player display above the episode text. To make this change, go to Settings->Display->Episodes. Find “Display player before episode description” and click on it to activate this setting. Make sure to save by clicking on the blue “Update Options” button at the bottom. Now, the podcast player will be featured right after your title for each episode, with any description or show notes following. You can read our FAQ at http://support.podbean.com/customer/portal/articles/1701434-podbean-%7C-how-do-i-display-my-podcast-player-above-my-show-notes-?b_id=4193 and contact support@podbean.com if you have any questions.